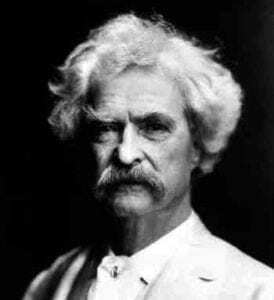 Mark Twain knew nothing of climate change or “global warming” is it is generally thought of today. He did, as seen from the quote above, understand that weather and climate are not the same thing. What happens when we no longer know what to expect? Skeptic or alarmist, in all cases it seems prudent to proceed with caution, awareness, and concern. Instead of vilifying people we don’t agree with, shouldn’t we at least consider what we do to our sustaining planet? Are we so sure of what to expect in ten years? Twenty? Fifty? Perhaps not. Is that a reason to blighly dismiss consideration of ideas you may not like? Don’t blame it on the Godless Left or the Reactionary Right. Think for yourself. Is that possible if you’ve got your head buried in the sand?